Toshiba has created such a good reputation for its innovation when it comes to producing high-class laptops. As a result, the company has gained a cult following all over the world. Using the same artistry and innovation, the company managed to produce one of the best microwaves in the market. Featuring a sleek design that screams pomp and elegance is the Toshiba 900 Watt Black Stainless Steel Microwave. This appliance boasts of six pre-programmed functions, a digital control panel and interior LED lighting. 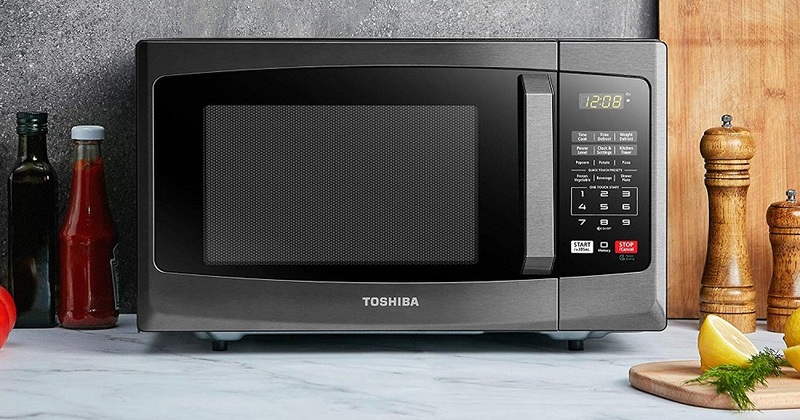 Toshiba outdid itself, despite taking a completely different turn with this microwave. The most obvious feature of this microwave is its elegant design. Made from premium stainless steel, this stylish microwave will blend in with any type of kitchen décor. The black stainless exterior contrasts well with the white interior and what results is an alluring appliance that will put a smile on your face each time you warm your food. This microwave has a small convenient design that can be squeezed anywhere in the kitchen. It is also quite light at just 27.3 Lbs. for easy stress-free movements. This Toshiba microwave comes with a glass turntable that spins whenever the microwave is turned on. This allows for even cooking of food and prevents burnt spots. Since it is made of glass, it can be easily wiped by a wet cloth. Alternatively, you can just remove it from the microwave and wash it with hot, soapy water. The turntable has a 10.6-inch diameter, which is large enough to accommodate considerably large cooking appliances. It is installed with an LED light that illuminates the interior of the microwave, as soon as it is switched on. Also included in its design is a transparent glass panel on the door that allows you to view inside. This is very convenient as you can catch all the action as it is happening in the microwave. The glass panel on the door is also constructed from sturdy heat strengthened material that makes it impervious to breakages. It is also very easy to clean by just a simple wipe with a wet cloth. This microwave boasts of six pre-programmed cooking functions that are activated by a simple touch of the button. They include popcorn, pizza, potato, frozen vegetables, dinner plate, and beverage. Each function has a button on the easy to operate digital control panel. For more flexibility, this microwave comes with a timer that allows you to set the cook time. What is amazing about this microwave is that you can quickly start it by simply dialing the number of minutes you want the food cooked and it will immediately start working. 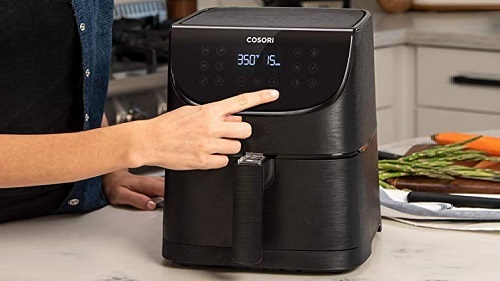 Additionally, if you want to add more cook time without the need to stop the microwave, you can just press the start button, and it will automatically add 30 seconds of cooking time. To stop the microwave, you can utilize the red stop button any time you see fit. 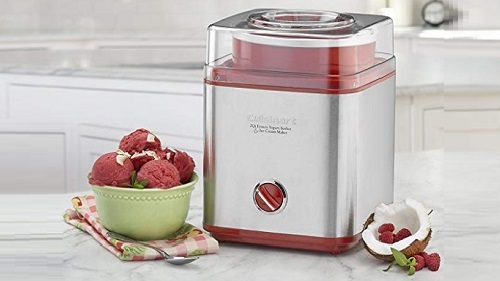 It offers ten power settings with an output power of up to 900W, which is enough to prepare any type of food. The choice to include a mute for the buzzer was really well thought out and is very commendable. Sometimes the buzzer can be very irritating, especially in the mornings when our bodies are still very drowsy from sleep. You can operate this microwave in “mute mode” to save yourself the headache of running to switch it off when the beeping sound goes off. To turn off the buzzer, long press the 8 buttons for 3 to 5 seconds. The buzzer will switch off after a long beep. This microwave also has a power saving mode, which starts operating when it is left idle for some time. The eco mode can also be activated by pressing the red stop/cancel button. Lastly, it has a child safety lock, which prevents young children from accessing it while in operation keeping them away from harm’s reach. The Toshiba 900 Watt Black Stainless Steel Microwave is a great appliance that is bound to take away your need for a traditional oven. 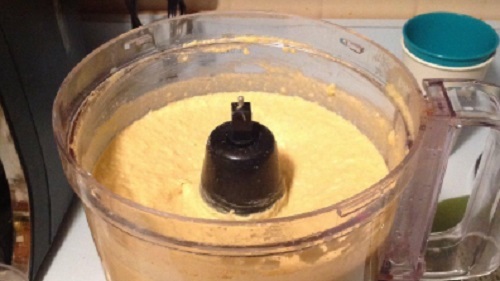 It can be used to prepare any type of dish and do not fret so much about its size. With 0.9 cubic feet of internal space, a full pizza will fit in it without a fuss. This is the perfect appliance for you if you love a bit of style and elegance into your kitchen décor.